I live in Louisiana, just southeast of Shreveport. I live on 6 acres with lots of critters. I have horses, dogs, rabbits and parrots. My animals are my life and I love them all unconditionally. I provide them with all the love and care that any animal could ever possibly hope for. My vet says that when he dies, he wants to come back as one of my pets! My Bloodhounds and my fosters have just stolen our hearts and have become our greatest passion. Our goal is to give them a home either permanently or for how ever long it takes until they can be adopted to their "For-ever Home". Being "put down" is not an option here unless health issues prevent them from having a content and happy life. Everyone deserves a second chance for a wonderful life and here they will get just that! Our staff is "ME" & "just me". I also rely on friends and family members to help us by lending equipment to do the chores that need to be done. I am so very greatful to all of them! 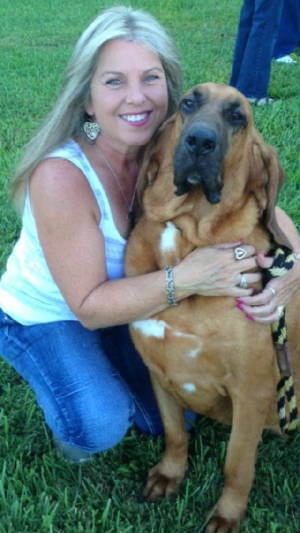 I am Karen Ponder, the founder of "For-Ever Home Bloodhound Sanctuary". My love and devotion to this particular breed has become my quest to do all that is possible in giving them the "For-ever Home" that they rightly deserve.